Secretary John Kali welcomed his counterparts from across the Pacific. Papua New Guinea has put ethical leadership and governance at the top of the agenda as it hosts 2017 Pacific Public Service Commissioners’ Conference in Port Moresby this week. 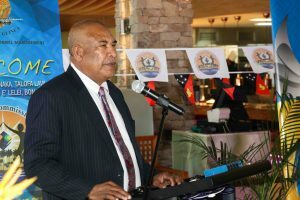 Department of Personnel Management Secretary, John Kali, said PNG was working through the Pacific Leadership and Governance Precinct to strengthen public service leadership at all levels. The Precinct is founded on two key policies – the Government’s Ethics and Values-Based Leadership and Management Capability Framework; and the Gender Equity and Social Inclusion policy. Mr Kali said he was looking forward to sharing PNG’s experience in reshaping its public sector with his Pacific counterparts. “Our Government’s policies promote the values that leaders in the workforce must have,” Mr Kali said. “These values allow them to be creative and productive in the workplace, but more importantly to be ethical, committed and passionate about their work. The Pacific Leadership and Governance Precinct is a joint initiative of the Governments of Papua New Guinea and Australia to strengthen the leadership capabilities of the nation’s public servants. Australian High Commissioner to Papua New Guinea, Bruce Davis, said it was fitting for the Precinct to support the 2017 Pacific Public Service Commissioners’ Conference. “Ethical leadership and strong governance in the public sector are fundamental for businesses to flourish, and for the delivery of essential services such as healthcare and education,” Mr Davis said. “The Pacific Public Service Commissioners’ Conference is aligned with this focus. The annual conference of Pacific public service leaders provides a forum to share information and experiences, and to identify, develop, cooperate and mutually promote public service excellence in the region. The 2017 PPSCC coincides with the second meeting of the Precinct’s Executive Advisory Board, which will enable discussions about the potential for collaboration between nations in the development of public sector leaders.